Brand owners are therefore looking to leverage provenance by investing in brand experience for entertainment, education and ultimately the loyalty of visiting consumers. The power of place is a vital way to stimulate them. Scientific studies show that our surroundings influence our emotions, thoughts and actions. In turn they provide us with stories to tell. The Rioja countryside has become one of the world’s leading laboratories for combining two creative pursuits: winemaking and architecture. In a region where tradition infuses everything, it is an unexpected place for a high-stakes game of modern architecture, one-upmanship. Inspired by the 'Guggenheim effect' on nearby Bilbao, that’s just what has happened, with vintners competing to commission bodegas design by today’s leading edge architects. Dare I say the results are now as good a reason to visit Rioja as the wine produced there but, in truth, the one enhances the other. At Laguardia, Bodegas Ysios is designed by Valencian architect Santiago Calatrava. The long, low structure and undulating pleated aluminum roof tucks into the surrounding Sierra de Cantabria mountain range. Meanwhile, near Logroño, French architect Philippe Mazières has created Bodegas Viña Real to resemble a massive oak vat. The experience at R. López de Heredia's Viña Tondonia must be influenced by Zaha Hadid's tasting room. Her clever, matte gold, and stainless steel space has been described as looking like a decanter from Sharper Image. The ideal trip is to continue on to Frank Gehry's eye-popping Hotel Marqués de Riscal, where the pink, silver and gold rumpled titanium and steel panels evoke the foil on the top of a wine bottle. But not all of us can experience visiting the brand source. This is where packaging design can play a vital role. Arinzano is the first estate in the north of Spain to receive the honour of the Pago classification. This is Spain's highest category for winemaking, awarded only to estates that exhaustively demonstrate not only an excellent and unique climate and terroir but also winemaking that turns these inherent qualities into extraordinary wines. A naturally special place made more so by the addition of stunning modern buildings. The spectacular arch entrance to the winery is designed by renowned Spanish architect Rafael Moneo, the only Pritzker Prize award architect in Spain. Man made and natural materials coexist naturally, as balanced as a good wine or design. 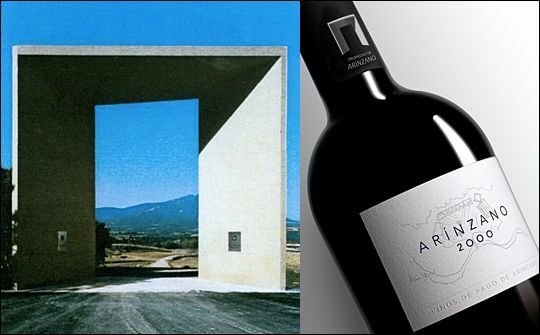 Moneo’s winery truly becomes integral to the terroir it occupies and its wine making purpose. Deep in the heart of Navarra, only a lucky few will experience the stunning Señorio de Arínzano first hand. But such a special provenance brought to life on the packaging, design by Lewis Moberly, can be enjoyed by many more. The entrance arch becomes the brand identity proudly welcoming on the bottle neck. Enter the estate through the bottle! And the experience extends to the labels where original sketches of the winery are layered into the design, rooting the brand in the place. Closer to home are our Scottish whisky distilleries. The Speyside river is lined with enticing glimpses of whisky pagodas and the white washed, windswept buildings of Islay punctuate the remote landscape. Each distillery has its own history, emotive stories and unique products. Single malt packaging has to be the prime catalyst to conjure up this sense of place. The Pictish stone in the grounds of Glenmorangie, the rocks and squally seagulls of Oban, become the inspiration for design which in turn evokes the power of place. Taking a little home with you, means more than the product. Take home the colours, the textures and the shapes. A visual summary which encapsulates the brand.